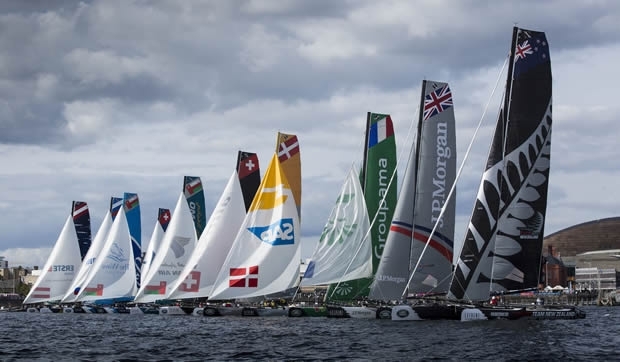 The Extreme Sailing Series racing on Cardiff Bay set sail today under bright skies and tactically demanding winds, that ended with the home team, J.P. Morgan BAR, in pole position. But it will be a night of repairs in the pitlane for three teams, ahead of the event officially opening to the public tomorrow as part of the Cardiff Harbour Festival. Today’s series of nine races came in thick and fast, each lasting less than 10 minutes, leaving the sailors muscling the huge sails at the front of the boat physically exhausted, and the tacticians and helms at back mentally drained. The new combination on J.P. Morgan BAR of Paul Campbell-James and Ben Ainslie – helped by some expert coaching from the legendary Kiwi America’s Cup sailor Simon Daubney were unstoppable, timing the starts perfectly as the fastest boat off the startline according to the SAP sailing analytics, leaving the rest of the fleet in their wake. By the ninth and final race of the day, the breeze was up and Race Management made the decision to remove guest sailors. Shortly after at the top of the track, GAC Pindar couldn’t hold back the pace during a tight mark rounding to keep clear of Groupama sailing team, careering into the side of the French boat on port, going from 10 knots to a standstill in seconds, leaving both with a long night ahead. The Danes are one point ahead of current Series leaders Alinghi, in third place, who showed a momentary uncharacteristic chink in their amour today with three race finishes at the bottom half of the pack. The Wave, Muscat is a further two points back, with Realteam – which was picked out by commentator and Extreme 40 veteran Nick Moloney as the team to watch this week – in fifth place, but with a night of repairs to a delaminated hull, after a scrap with Gazprom Team Russia. Oman Air, which came out of the blocks scoring a bullet in the opening race in Cardiff, is just behind Realteam in sixth place with 44 points. With a start line just 30 metres wide and set just off the shore, the pre-start strategy was essential, with 11 boats jostling to find the best spot, hunt out clean air and trying to stay clear of the dog fight mid-fleet. Emirates Team New Zealand found themselves deeper in the pack then they would have wanted for most of the day, but a late surge and a race win in race seven salvaged some valuable points. With gusts of up to 20 knots forecast for tomorrow’s racing, the Extreme 40 teams and are bracing themselves for an action-packed, hull flyer of a day, with plenty more races to be sailed, and plenty more work to do.